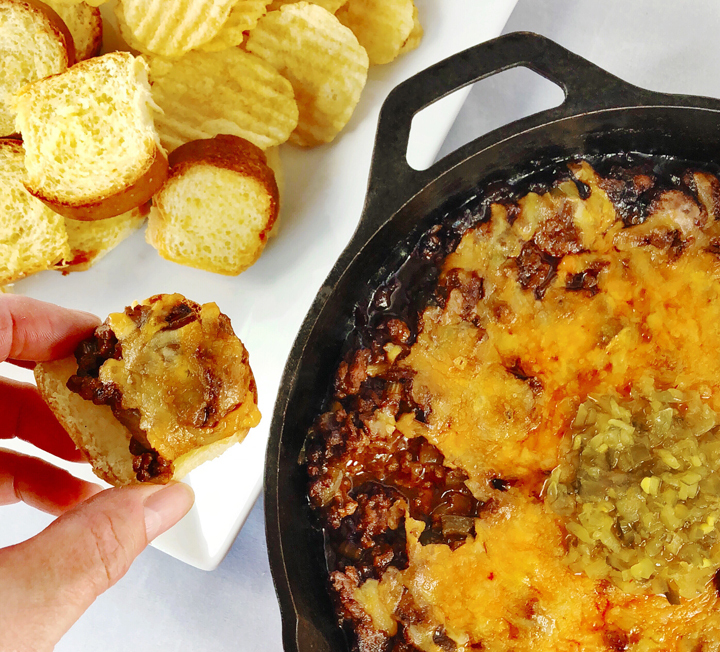 This beefy dip appetizer will upgrade your Tailgate or Football Watch Party to the championship level. While the charm of Sloppy Joes is the messy sandwich, when it comes to partying this easy recipe makes a neat little dip. Serve with mini bun pieces (made from hot dog buns) and/or crunchy kettle chips for dipping. Serves 8-10 appetizer portions. Heat the oil in a large cast-iron skillet over medium-high. Add the beef and cook, breaking up with a spoon, until browned on all sides but not thoroughly cooked through, about 6–8 minutes. Transfer to a medium bowl with a slotted spoon, leaving the remaining fat in the pan. Reduce the heat to medium, put the pan back on and add the onion, bell pepper, and garlic, stirring, until tender but not browned, 6–8 minutes; season with a few pinches of salt and a pinch of black pepper. Add the Ancho chili powder and cook, stirring, until fragrant, about 1 minute. Add the tomato sauce, ketchup, Worcestershire, mustard, molasses, and the beef along with any accumulated juices back into the pan. Bring to a simmer and cook, stirring and scraping up any brown bits, until mixture is thick and saucy, about 15 minutes; season to taste with salt and pepper. Top with the shredded cheese and cover to melt the cheese, about three minutes. Top with the pickles and serve with toasted bun pieces and kettle chips for dipping. Preheat the oven to 350˚F. Lay the bun slices on a parchment lined sheet tray. Brush lightly with the melted butter and sprinkle with salt. Bake for 10 minutes until toasted. Serve warm with the dip.